10:00 a.m.-11:20 a.m. D-Line Run and Pass Rush Techniques in a 3 man Front. Marc Yellock, D-Line Coach, University of North Texas. 10:00 a.m.-11:20 a.m. Linebacker Basics/Defending the RPO's. Bradley Dale Peveto, Linebacker Coach, Texas A&M University. 11:30 a.m.-12:50 p.m. All Phases of Receiver Fundamentals. David Gru, Wide Receivers Coach, SMU. 1:00 p.m. - 2:20 p.m. Baylor's RPO Game. Matt Rhule, Head Coach, Baylor University. 2:30 p.m.-3:50 p.m. Plan-Perfect-Produce/Defending Trips. Don Hyde, Head Coach, Waco LaVega High School. 4:00 p.m. - 5:20 p.m. Inside Zone and RPO Tags. Jon Kay, Head Coach, North Shore High School. 5:30 p.m. - 6:50 p.m. Block Protection and Tackling to Defend Today's Offenses. Josh King, Head Coach, Longview High School. 8:00 a.m. - 9:20 a.m. Run and Pass Blocking Techniques for HS and College. Spencer Leftwich, O-Line Coach, Lake Dallas High School. 8:00 a.m.-9:20 a.m. Running Back/Skills/Drills to Attack the Perimeter. John Wozniak, Running Back Coach, Oklahoma State University. 9:30 a.m.-10:50 a.m. Ways to Defend the Spread. Jay Bateman, Defensive Coordinator/Safeties Coach, University of North Carolina/formerly Army. 11:00 a.m.-12:20 p.m. Establishing a Culture of Belief/3 Level Passing Game. Tom Herman, Head Coach, University of Texas. 12:30 p.m.-1:50 p.m. What Do You Believe In?/Cover 2 Concepts. Larry Harmon, Defensive Coordinator, University of Mary Hardin Baylor. 2:00 p.m.-3:20 p.m. Spread Option. Matt Wells, Head Coach, Texas Tech University. 3:30 p.m.-4:50 p.m. Defending the Spread. Pete Golding, Defensive Coordinator, University of Alabama. 5:00 p.m.-6:20 p.m. O-Line Fundamentals. Kyle Flood, O-Line Coach, University of Alabama. 8:00 a.m.-9:20 a.m. Cover 4 vs. Multiple Formations. Tony Salazar, Defensive Coordinator, Austin Westlake High School. Travis Reeve, Head Coach, Cuero High School. 11:00 a.m.-12:20 p.m. O-Line Play in the Pistol Veer. Jeff Ellison, Head Coach, Odessa Permian High School. 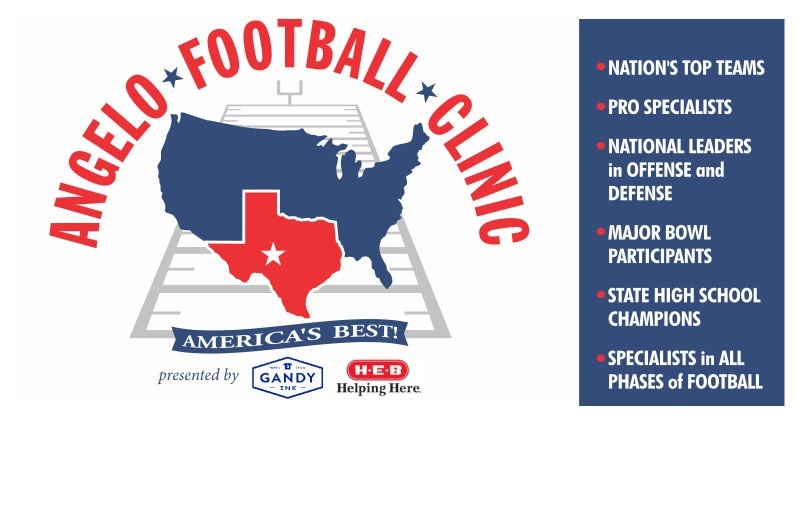 Copyright © 2018 Angelo Football Clinic.